Japanese Episode DP 023: "Roaring Haganeil! Protect the Village of the Bipper!!" American Episode 487: "Faced With Steelix Determination!" The Rocket-Dan are digging holes one day when their shovels become stuck in the ground. Before long, the trio discovers that they've inadvertently wedged their tools into the head of a Haganeil that had been sleeping underground! The pokemon starts to chase after the Rocket-Dan while elsewhere, Satoshi and his friends come across an injured Bipper. After healing its wounds, our heroes decide to guide the pokemon back to its village. On the way, the Rocket-Dan cross their path. The steel-type pokemon who was chasing them decides to go after everyone, so Satoshi-tachi and Musashi-tachi are forced to run for their lives. After becoming separated for a while, our heroes eventually find the Bipper's village and hide out there for a while. With the help of Nyasu's translations, Satoshi-tachi determine that the other Bipper didn't go out looking for their injured comrade because they were afraid of Haganeil. Determined to protect the pokemon, Satoshi decides to calm their pursuer. After luring Haganeil into a gully, our heroes combine their pokemon's power to remove two of the shovels from the pokemon's head. As Haganeil begins to head toward a waterfall, the timid Bipper decide to combine their power to stop the pokemon. The final shovel is pulled out, quelling Haganeil's anger and preventing it from falling into water. Now that the steel-type pokemon has calmed down, our heroes are able to return to the path toward Sono'o Town. This episode, like the pokemon who debuted in it, really didn't hold my interest. It was just another generic plot about saving a bunch of timid pokemon who, by the end of the episode, find the courage to blah blah blah blah. It's a tired plotline that's been done to death, both in this series and in countless others. I was also weird to see how sinister Satoshi-tachi were in this one. Am I the only one who thought the heartless way they talked to Nyasu (especially Hikari) was really out-of-character? The dub keeps a pathetic four pieces of Japanese music intact, which makes me wonder how PUSA decides which music to keep. I mean, the music from the Diamond & Pearl games that ends this episode, for example, had to be re-edited for the dub to cover the three seconds PUSA tacks onto the TO BE CONTINUED screen. Why go to all that trouble to keep that piece of music but then change so many others? It really does boggle the mind. Haganeil keeps its Japanese voice. Jessie: "Maybe they know we ripped off the most expensive shovels ever made!" James: "If so, then let's show them that you don't rob the robbers!" Meowth: "I'll say this...with that grip, we might need a change of plans!" 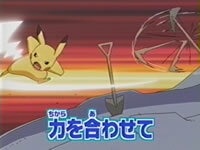 In the Japanese version, they don't say the shovels were stolen. Instead, they talk about how they need to get them back because their "precious shovels" so vital to the Rocket-Dan's plans. If you think about it, shovels really are important to so many of the Rocket-Dan's schemes, so the dialogue in the Japanese version makes sense. The only reason I can see for the dub changing the dialogue is because...maybe PUSA wanted to remind us that the Rocket trio are still thieves and that they can pull of a successful theft every once in a while? I dunno. From the time the Bipper jump onto Haganeil's head to pull out the last shovel until the time they actually pull it out, the song Spurt! can be heard in the background. In the dub, this is replaced with dub-made instrumental music. The TO BE CONTINUED screen is made three seconds longer.